Hand's up if you are guilty of wearing your hair band around your wrist 'just in case' it's needed? It's an age-old habit that puts convenience before cool, until now that is! Doublewear is hitting Boots this month - nikel free 2 in 1 hair assessory cleverly disguised as an item of jewellery. Available in silver or gold, and comes in a stylish bracelet or necklace design. 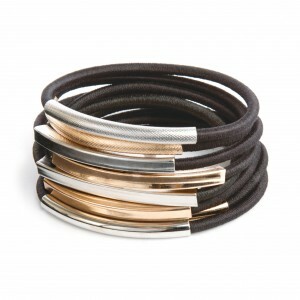 Bracelets morph into hair elastics and necklaces become headbands and they look trendy worn stacked together! Goody Double Wear is priced at £3.75 and are available from Boots. Genius idea! i bet my silly poxy boots doesn't have it!